Chook Chow is a unique and hugely popular meal-form chicken food suitable for laying hens and pullets. It’s a wholesome and tantalizing mix of whole and crushed grains (New Zealand grown) which include maize, barley and wheat, with added soya meal for extra protein, and a vitamin and trace mineral premix for laying hens. Chook Chow is an irresistible meal which is completely vegetarian (it contains no meat meal, blood meal or fish meal) and includes oven dried oyster grit to enhance egg shell strength. It’s not only a delicious meal that chooks love, but a truly complete feed. 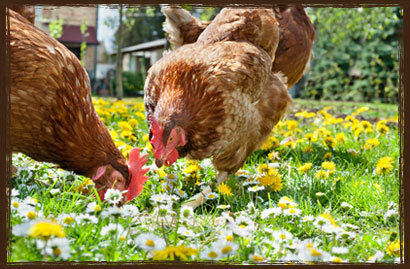 Feed approximately 1 handful of Chook Chow per bird per day, and ensure clean water is always available. To find out where you can buy Chook Chow, please visit our Distributor page.